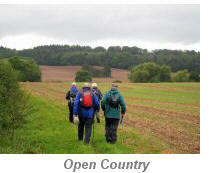 This easy 7 mile circular walk combines the delights of both town and country walking. 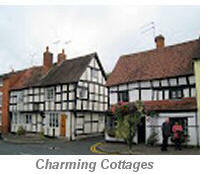 Starting in the Coughton you will enjoy riverside paths, country lanes and gentle farmland. It is mostly flat and very dog friendly. There is also the chance to visit Coughton Court, an interesting and attractive National Trust property. 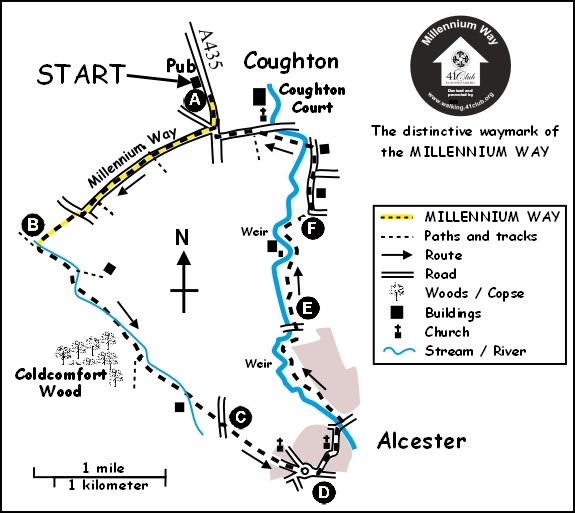 The first part of the walk incorporates a short section of the Millennium Way, where you will be guided by the distinctive black Millennium Way waymarkers. Find out more about the walk by clicking on the information icon. You will eventually cross a small ford into a large field. Go immediately 1/2 right for approximately 20 paces, then bear left to pass between large oak tree on left and smaller tree on right to stay along field edge keeping very wide ditch on your right. (Depending on time of year, there may be a small brook running in the ditch, known as Spittle Brook). Continue with ditch right crossing dip in corner of field into next field, again to continue with wide ditch on right and Coldcomfort Wood 200 yards on far right. Pass through hedge gap and stay on same line with ditch right to pass under power lines. At the end of field where you arrive at a broken hedge directly ahead, turn right along rough track (over ditch) for 70 paces to find corner waypost under oak tree. Here we turn left to join The Monarch's Way and stay along with hedge and trees left. The ditch and small brook are now on your left. Stay along the partly surfaced track to reach a T - junction. Here you will see Coldcomfort Farm on the far right. Go left at this T - junction walking away from the farm past the bench on the left and continue along the lane towards a main road. Go past Allimore house on your left and just before meeting the main road take the incline on right to reach and then cross the bridge over the main road. Once over the bridge stay ahead into Allimore Lane and continue along past The Field House crossing bridge over disused railway line to enter the outskirts of Alcester. Go over the crossroads into Seggs Lane and continue ahead to pass the Alcester Fire-fighters Memorial Garden (worth a short visit) and the Fire Station on your left to reach a roundabout. Cross over the roundabout into Swan Street in the direction of the town centre and just past the pedestrian traffic lights turn left into High Street. Continue along the high street to pass to left of St. Nicholas Parish Church down the adjacent alleyway, passing Church House, to arrive at the ancient Alcester War Memorial Town Hall. (There a plaque on the wall of historical interest), Continue past the Town Hall into Henley Street with the road soon bearing right to become Kinwarton Road. Cross the bridge over River Arrow and 20 yards before Gunnings Road just in front of a small brick building turn left along narrow track to pass The Grieg. Continue along between hedges and keep River Arrow on your left. Stay along the riverside path with river left passing by the children's play area and sports pitches. At the end of the sports field bear slightly left staying along the track with river left. Go past picnic tables and at surfaced track go right for 30 paces then take gap left through three yellow metal posts to go through area of woodland. Stay ahead on narrow track through the woodland , ignoring any side tracks, to eventually emerge at a service road. Go left following waymarker, passing a building right and keeping river left. On reaching a main road (with metal barriers), cross over and take footpath (just to the left of Arden Court) which continues along the riverside. Emerging into a large field stay along track with river left. Pass through three fields reaching a small weir in front of a large industrial estate on the opposite bank. Continue through way marked gap and stay ahead under power lines to bear right, away from river. Passing a gas pipeline marker on left, go through nearby gate into farm fields. Two further gates take you onto lane. Go left on lane eventually passing Millford Cottage and then Millford House. A few paces past Millford House take the hidden narrow waymarked footpath left (easy to miss). Here we take a metal bridge across the River Arrow and through a metal gate into large field. Continue ahead across field towards the farm buildings in the far distance and take a metal kissing gate to next field. Go 1/2 right to exit this field via metal gate to lane. 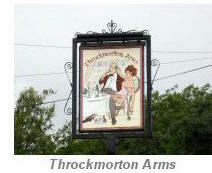 Turn left on lane to reach the main road (A435) then turn right up the road to return to the "The Throckmorton Arms". Named after the family who since 1409 have occupied, and still occupy Coughton Court. A mainly Oak & Hazel wood. Passing through, together with the Millennium Way, is part of the Monarchs Way, a 615 mile, long distance footpath, which is supposed to closely follow the route of Charles the second's escape after his defeat at the battle of Worcester in 1651. 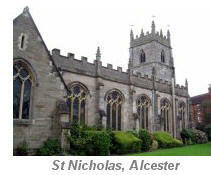 Alcester is an old market town of Roman origin at the junction of the River Alne and River Arrow. 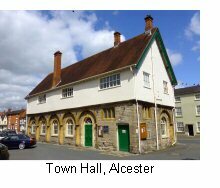 In Roman times Alcester (Alauna) was a walled town and Roman fort of some importance being located at a junction between the Ryknild Street Roman road and the ancient Saltway from Droitwich and the Roman road from Stratford upon Avon and the Fosse Way. Today, entry is via rather non-descript suburbs until the High Street is reached. Here the buildings become more interesting, with a number of preserved Tudor and other houses, notably those near the parish church, in Butter Street and in Malt Mill Lane. The Old Rectory, situated directly in front of the church, is a particularly interesting example of Georgian architecture. 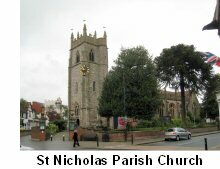 The parish church of St. Nicholas has a 14th C exterior but the whole interior was remodelled in Classical style in 1729-33 by Edward and Thomas Woodward. A two-storied building of 17th-century date, it stands to the north of the church. The lower story consists of a stone colonnade, filled in by 1873, and was built about 1618. It was originally intended to build the whole in stone, but this was found to be too costly and it was decided to make the upper story of timber. The basement was also used as a prison - and was still in use as the town's lock-up as late as 1850. The Throckmortons were a catholic recusant family who refused to give up their faith and suffered the consequences. They were involved in both the Throckmorton Plot of 1583, a conspiracy to execute Queen Elizabeth I and the Gunpowder Plot, the plan to blow up Parliament and kill the King in 1605. Full details of the very interesting history of both the Court and Church can be found in the ‘points of interest’ page for walk 23 – Coughton Circular.